I am going to be completely honest, today watching the Bears game I threw my Bears hat across the room. Jamies Winston was facing a 3rd and long was pushed all the way back to his goal line just to scramble around like a pickup game and deliver a 40-yard strike. The very next play, the Jamies Winston delivered another long strike. Just like that, it went from 17-10 with the Bears about to get the ball back, to being down 24-10. I didn’t know it at the time but the game was over. This is especially disappointing because the Bears were playing a very beatable team after a bye week. So, what happened? The Bears were supposed to play angry. They were supposedly much better than their 2-6 record. If you spent any amount of time talking with Bears twitter, they were about to go on an 8-game run. Instead, they put up a feeble 10 points (7 of them being on a Hail Mary), had a handful of turnovers and ended up being blown out. This painful experience was punctuated by the rest of the active teams in the NFC North continue to lose. The Bears have let another opportunity slip away. While I was watching the game clock wind down and the hopes of this season becoming anything meaningful slip away, I couldn’t help but think back to last season. The Bears went out on Thanksgiving night, beat the Packers but the rest of the season ended up being pretty meaningless. Have we not moved forward? Is this season the same as last? Have we really just spent the last year spinning our wheels to find ourselves back at the drawing board? While no doubt, this game felt terrible, I feel like there has been progress. It can be hard to see it after an effort like the one we saw today, but it is there. And yes, next year there will almost certainly be new faces on the sidelines and on the field, progress has been made. Some of you are reading this thinking, what progress Ben? They are 2-7! Yes, that is true, but there is something to be positive about. Young talent. The Bears may be 2-7 and they may have just gotten throttled by an underwhelming Tampa Bay team, but the contribution of the 2016 draft class is undeniable. It can be tough to find optimism in the face of another losing season but sometimes you need to step back and see the forest through the trees. The Bears have a strong interior line with Cody Whitehair holding it down at center. 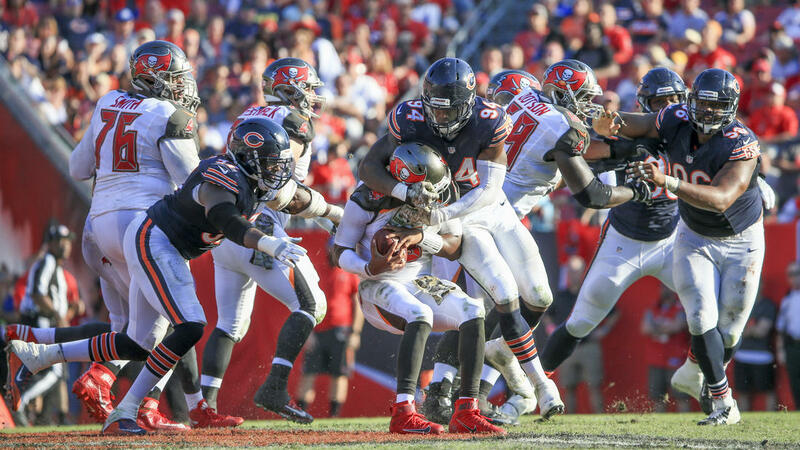 Leonard Floyd has just extended his sack street for his third straight game. Jordan Howard put up another 100-yard game and continues to be a force. I could go on but the point is that the Bears have more young talent in place than last year. They have young talent contributing and gaining valuable experience. The Bears are not good right now but some of the pieces are in place for them to be good. I have also said for a while that the Bears are more than the sum of their parts. Which in some respects is really unfortunate but it also means a turnaround can happen faster than you might think. I am not going to sugarcoat this loss. I expected a win. It was tough to watch. But hang in there because the Bears are not as far away as it seems. I will spend the rest of the season watching the Leonard Floyd get better every game, forgetting Cody Whitehair is a rookie and the combination of Goldman and Bullard wreak havoc. Oh, and yes, I will probably still spend a decent amount of time yelling at my TV and scaring my cats. Bear Down! Did you miss our Week 10 Postgame Show?